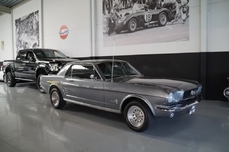 General description : For Sale in our Detroit Showroom is a very impressive 1968 Ford Mustang Shelby. 1968 marked the end of the first generation Mustang Shelby production. 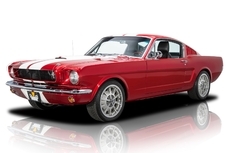 The Shelby GT Mustang was offered as a higher performance model and was introduced into the Mustang line-up in 1965. 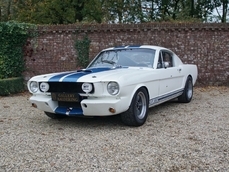 This Mustang has had every aspect of its originality modified and is a mean machine. The first thing that anyone would notice walking up to this beast is the enormous supercharged 429CID BOSS Ford Hemi Powered V8. 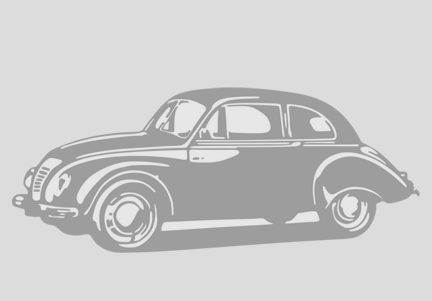 The extensive work that has been done to this engine is out of this world. This beast has enough horsepower to pin you to your racing seat at the touch of the throttle. Remember, this is a fully authentic and document 1968 Shelby Mustang which has underwent extensive modifications to be the biggest and best drag car at your local strip. This powerful Shelby is equipped with a highly modified 3-Speed Automatic C6 Transmission. The rear gear ratio is set up at 4.86 in the rear which allows for neck snapping power off the line. The enormous, sticky Mickey Thompson tires do a great job of keeping this Mustang planted and going in a straight line while flying down the drag strip. With less than 2000 miles since its complete rebuild, this Shelby is guaranteed to turn heads and snap necks on a daily basis. This pretty pony is wrapped in a shiny coat of Black along with metallic flake gold racing stripes which are a Shelby trademark. This Shelby is also equipped with Power Brakes with a complete Wilwood set-up to ensure a safe stop after exceeding 150MPH in no time. The interior sports a full roll cage with Shelby style racing seats and racing harnesses to make sure you stay strapped in for the ride. 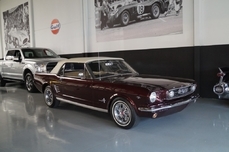 This Shelby Mustang is sure to impress its next owner and you will be hard pressed to find one this nice. 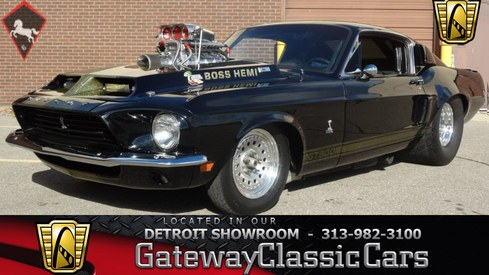 For more information including over 100 HD photos and video of this beautiful Shelby Mustang please visit http://www.GatewayClassicCars.com or call to speak with one of our friendly and knowledgeable staff at 313-982-3100. 1968 Ford Mustang 429 CID Supercharged Boss Hemi V8 is listed for sale on ClassicDigest in Dearborn by Gateway Classic Cars - Detroit for $84000.